Dear friends, the opening of the exhibition "inside Brazil" Curated by Silvia Evangelisti and Stefania Cesari, at the dome of Santo Stefano's cloister in bologna, has been a great success. The exhibition is open until 8 February and this week we are the program Art City for Artefiera 2017, so tomorrow, the three of us artists we'll be doing live performances for the Art White Night. 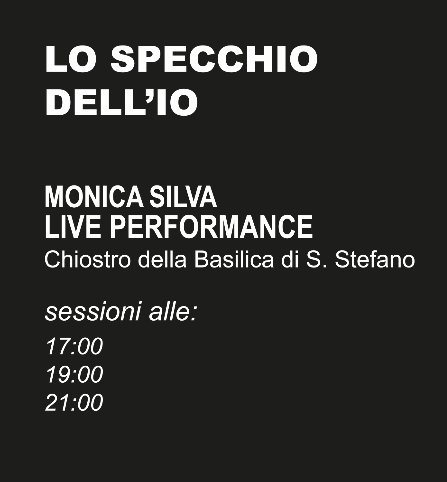 The Ego in the mirror: Monica Silva live performance. I'll portray the visitors who want to pose for a portrait in a set done for the occasion. A Mirror, a camera. Your 'I' that you already know and another one that I'll will reveal in you. What time? At 5pm at 7pm and 9pm.